Buzzfeed reports that Facebook is testing a new feature in its Messenger app that will either be extremely helpful or highly creepy, depending on how you look at it. Called ‘Photo Magic,’ it scans your Camera Roll to find Facebook friends. Yes, your Camera Roll. You don’t even have to upload your photos. 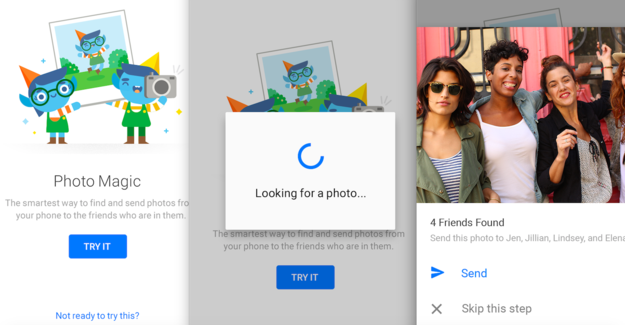 Provided you give Facebook Messenger the requisite access to your photos and opt into the feature, Photo Magic will use its facial recognition technology to help you notify friends on Facebook when you’ve taken a photo of them. Lets say, after a night of karaoke, I take a photo with my colleagues Natt Garun and Nate Swanner. After that photo is taken, I will get a notification to ask me whether I want to send it to them via Messenger. The rate at which Photo Magic scans your photos depends on your device: for Android users, scans will occur every time a photo is taken; for iOS users, it will be less frequent. The feature will also only scan new photos — not old ones. This is either great or terrible. Facebook is clearly trying to do its audience — currently limited to a test group in Australia — a service by making photo sharing more easy and accessible. It is, of course, entirely why its Moments app exists. However, this will also likely be even more of a disincentive for some people who are really attuned to privacy. You will be able to toggle the service on and off, to your liking, but if you’re not interested in giving Facebook access to your photos, you should pass. The Photo Magic feature is available for Australian Android users today, and will roll out to Australian iOS users shortly.